Mosaic Knitting - an Easy Alternative of Fair Isle Knitting. Mosaic knitting or two-color slip-stitch knitting is one of a few techniques which give so many variations of patterns, to choose from. If you like Fair Isle knitting patterns, but still not sure about carrying two colors at once, slip-stitch knitting is right for you. Using this simple technique, you can create any kind of design for your garment. Make stripes, borders, panels, combine them with each other to make a whole sweater, dress or skirt. There are many more possibilities for your creativity. Work two-three inches of one pattern, change it to another pattern or just use the same one, but change one or both colors, and so on. Does it sound too confusing and complicated? It might. Till you understand a general idea of this really simple and awarding technique. 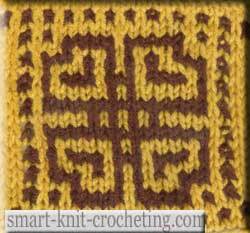 Let's try to knit a couple of the simple patterns using slip-stitch knitting. What kind of skills will you need? 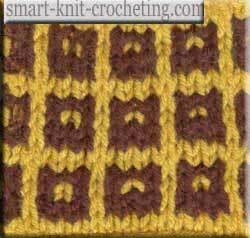 A knit stitch, purl stitch, and a slip stitch are all you need to work the patterns presented on this page. Knitting pattern has two different sides: Right side and Wrong side. Begin EVERY Right-side row from a NEW color. Work a Right-side row and a Wrong-side row with the same color. Let it be Color A.
Right-side rows. Every slip stitch is slipped with yarn in BACK (behind the slip stitch). Follow a chart for the Right-side rows. Each Wrong-side row is EXACTLY like a preceding Right-side row: work every stitch being worked in the Right-side row, slip every stitch being slipped in the Right-side row. 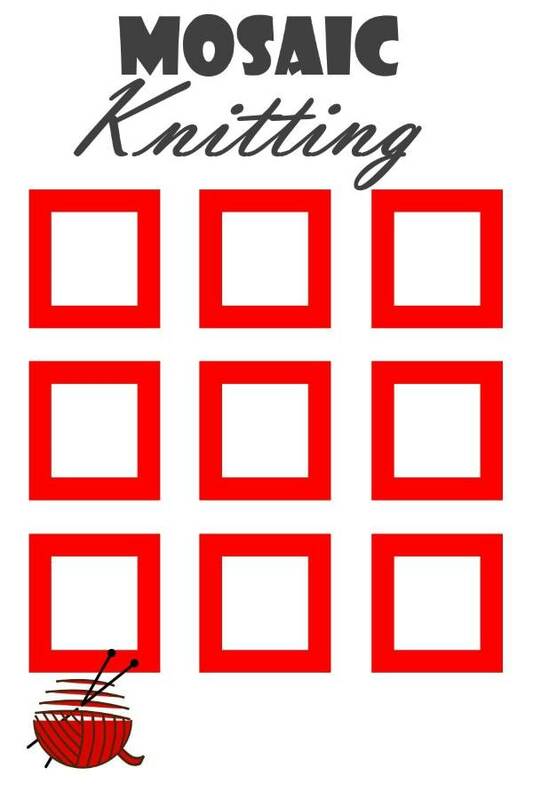 Knit Your First Mosaic Knitting Patterns. Pattern # 1. Usually mosaic patterns are presented in charts like this one in the chart. A color bar on the right indicates which color (A or B) should be worked for each row. Numbers by the letters indicate the ODD (right-side) rows. Read and knit them from RIGHT to LEFT. Wrong-side rows usually are not presented on the chart. To knit them, read the pattern of the preceding right-side row from LEFT to RIGHT since they are exactly the same. 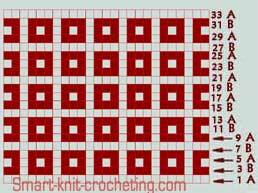 Here is one more rule, to keep the edges of your knitting fabric neat. Always KNIT the very first and the very last stitch of the right-side row. Always SLIP the very first and the very last stitch of the wrong-side row. Now let's make a swatch. Follow the chart above. Cast on 25 stitches. Row 1A. Color A. It is a preparatory row. Knit all 25 stitches. Row 2A. Color A. Slip first stitch, purl 23 stitches, slip last stitch. Row 3B. Color B. Change color at the beginning of the row. Read pattern from right to left: knit 2, *slip 1 (yarn behind! ), knit 3*, from * to * repeat 5 times, slip 1, knit 2. Row 4B. Color B. Read pattern from left to right. Slip the first stitch, purl all the stitches which you worked in row 3B, slip all the same stitches (keep yarn in front!) which were slipped in the row 3B, slip the last stitch. Row 5A. Color A. Change color at the beginning of the row. Read pattern from right to left: knit 1, *slip 1 (yarn behind! ), knit 1*, from * to * repeat 11 times, knit 1. Row 6A. Color A. 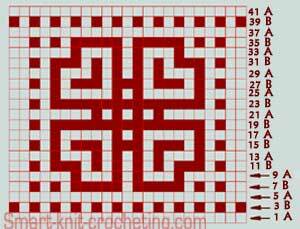 Read pattern from left to right. Slip the first stitch, purl all the stitches which you worked in row 5A, slip all the same stitches (keep yarn in front!) which were slipped in the row 5A, slip the last stitch. Row 7B. Color B. Change color at the beginning of the row. Read pattern from right to left: repeat Row 3B. Row 8B. Color B. Read pattern from left to right. Repeat Row 4B. To continue pattern, repeat rows from 1 to 8. Cast on 23 stitches. This pattern is not that easy like the first one. Nevertheless all rules for knitting it are the same (see above).